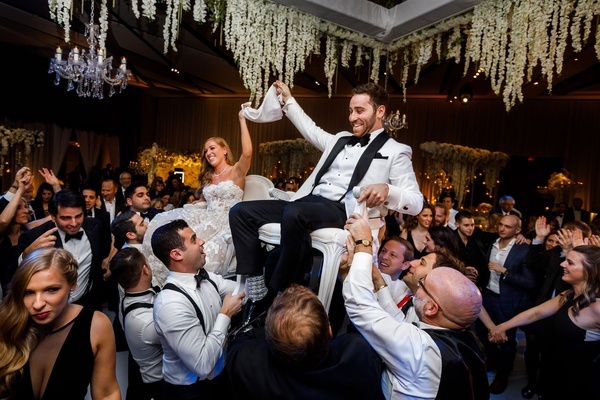 Though they had met briefly in the past, it was at a New Year’s Eve party when Kara Zelman and Jeremy Rosen struck up a lively conversation. 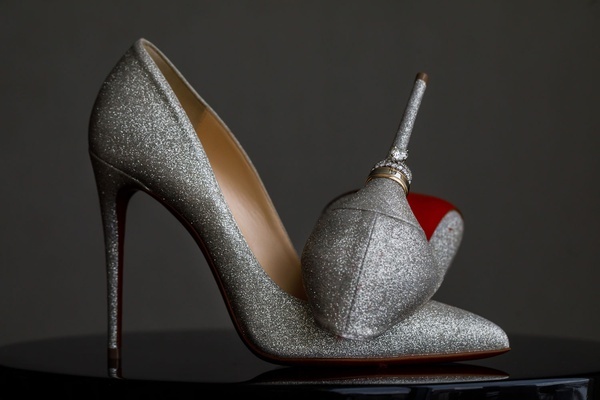 “I remember being instantly attracted to her and her personality,” admits Jeremy. 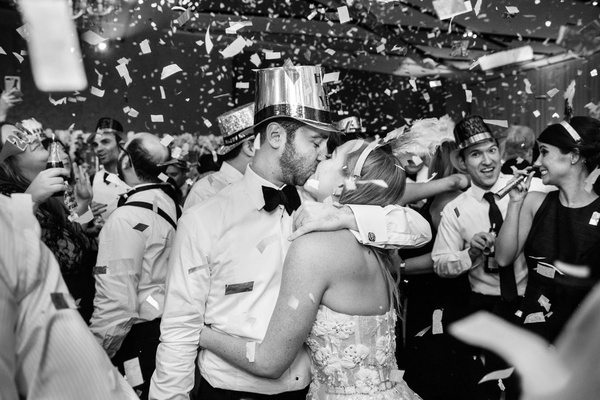 Four years later, the two became engaged and spent the next year planning for an unforgettable wedding celebration in their shared hometown of Cleveland, Ohio – appropriately scheduled for New Year’s Eve. 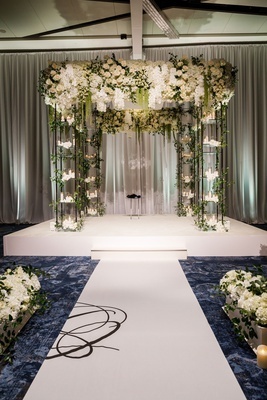 The bride knew she wanted a striking all-white décor scheme and an especially beautiful chuppah for the ceremony. 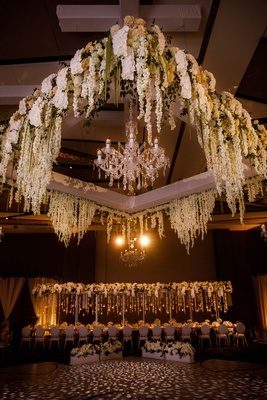 Her floral and event designer, Joe Mineo, suggested adding greenery to the structure to make the contrasting colors pop. “I loved it!” Kara exclaims. 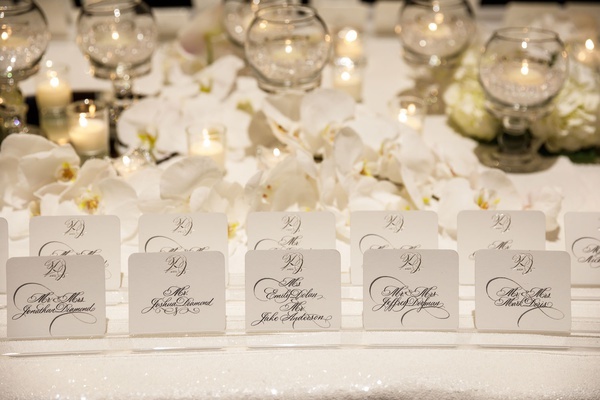 A string quartet played “Stay” by Rihanna as the bridal party processed. 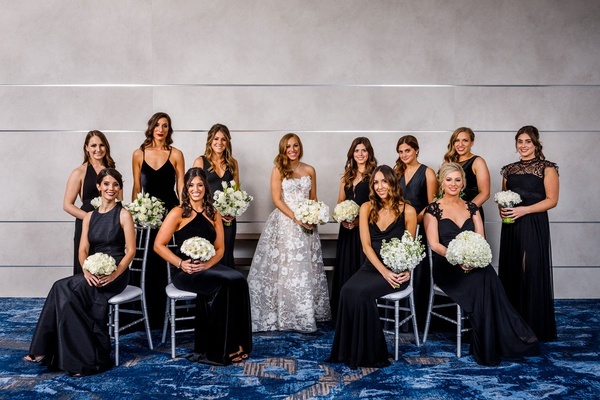 Bridesmaids wearing ebony dresses in a variety of regal designs carried nosegays of different cream flowers: roses, tulips, ranunculuses, hydrangeas, roses, freesia, and lisianthus. 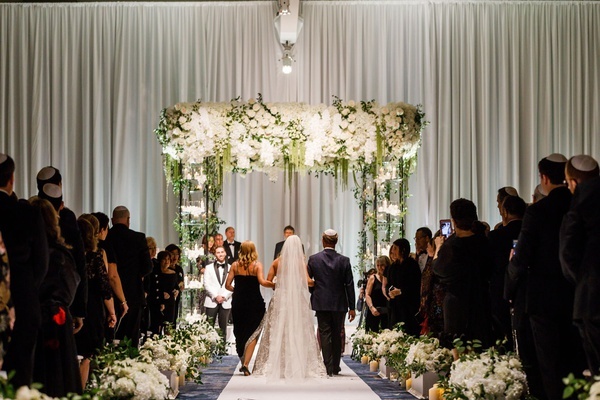 When the musicians began to play “Hallelujah” by Leonard Cohen, guests were asked to rise for the bride’s grand entrance. 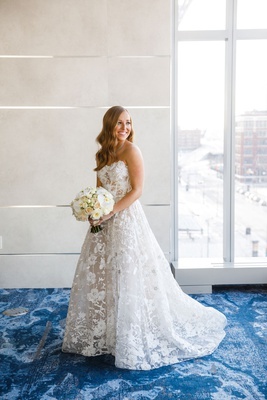 Kara looked angelic as she walked down the aisle runner by The Original Runner Company on the arms of her parents. 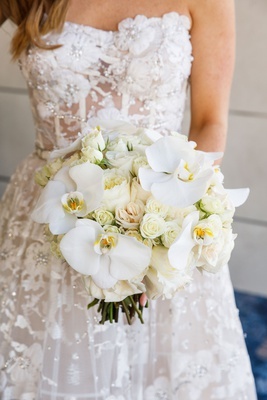 She wore a gorgeous strapless gown with floral appliqués from Dimitra’s Bridal Couture and held a romantic bouquet of Vendela, spray, and David Austin cabbage roses, as well as phalaenopsis orchids. 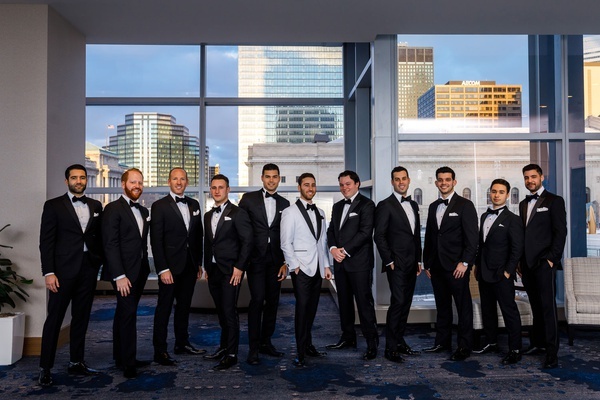 Her groom, just as dapper, donned a full white tuxedo complete with a velvet bow tie. 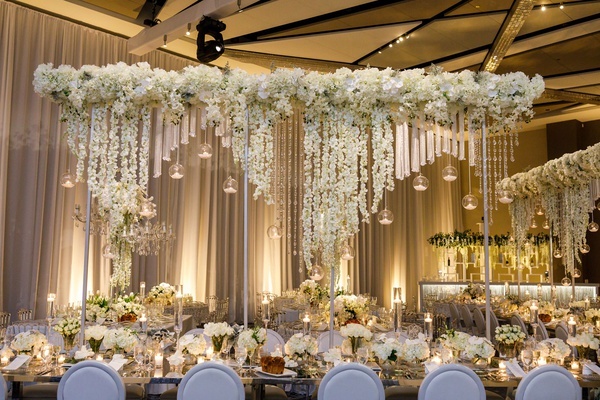 Loved ones later entered the space for the reception, which had been transformed into a winter wonderland filled with sparkling accents. 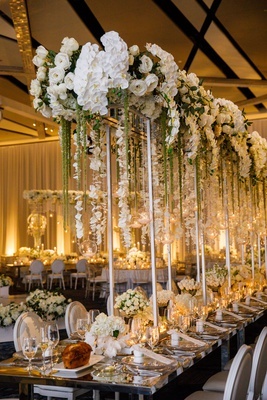 Dramatic displays of flowers had attendees in awe; there were four different types of stunning centerpieces, boxes of blooms surrounding the dance floor, an enormous ceiling treatment with crystals and votives suspended overhead, and additional artful creations behind the bar, band stage, and photo booth. 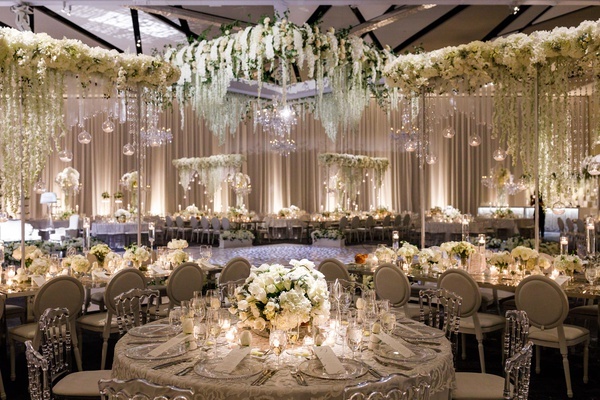 The tables themselves were either covered in sequined linens or featured mirrored tops and the entire room was meticulously draped in sheer, ivory fabric. 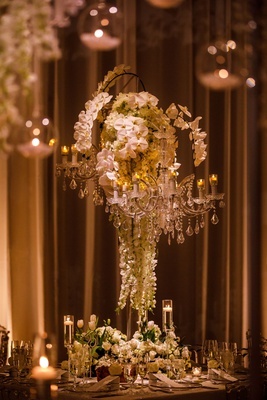 Several chandeliers and hundreds of candles reflected light off one another to complete the dreamy ambience. 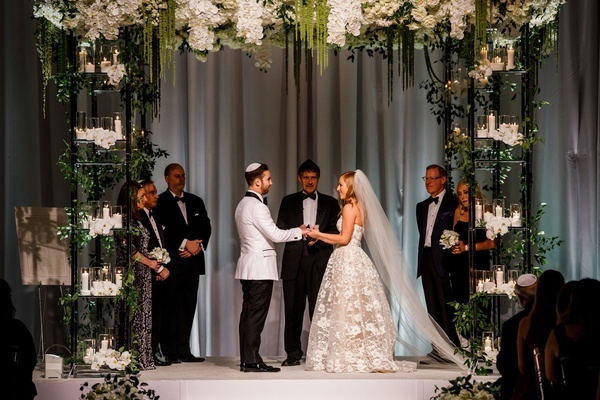 With over 350 friends and family in attendance, the couple settled on a scrumptious four-course dinner, which included freshly baked flavored challah bread. 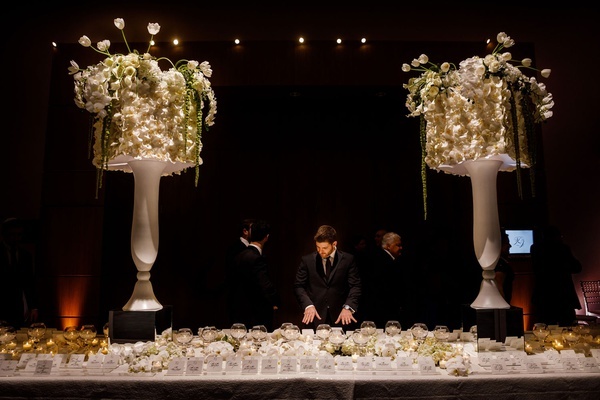 For dessert, slices from the five-tier square confection bedecked with cascading sugar flowers were served. 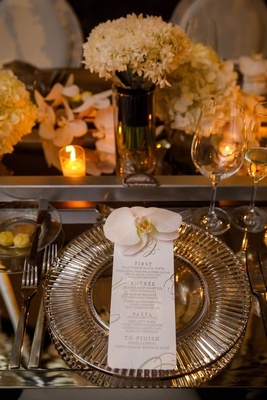 In lieu of wedding favors, the couple planned for late-night treats, including Swenson’s (the couple’s favorite burger joint), Oreo cookies covered in sparkly white chocolate, and a hot chocolate station stocked with various toppings and mixes. 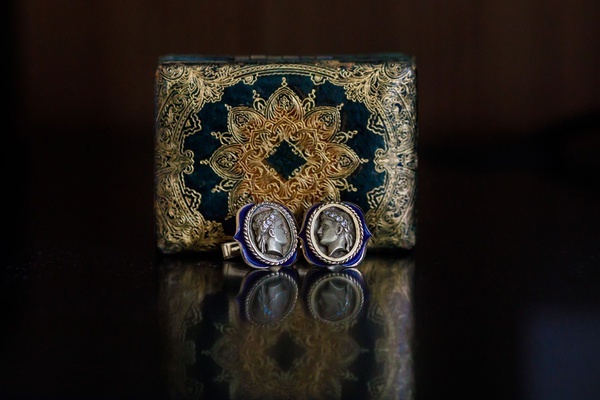 For Kara and Jeremy, their wedding day set the New Year off to a perfect start and they wouldn’t have had it any other way. “Everything was flawless,” Jeremy confirms.